^ Post Rust, Susie. "Fishing villages along Central America's coast pulse with the joyous rhythms of this Afro-Caribbean people". National Geographic. Retrieved 2007-09-21. ^ "2005 American Community Survey: Race and Hispanic or Latino". U.S. Census Bureau. 2000. Retrieved 2007-10-11. 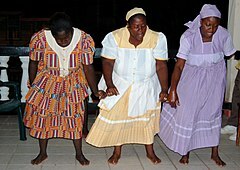 ^ "Garifuna". Oxford Dictionaries. Oxford University Press. Retrieved August 22, 2018. ^ "Garifuna". Merriam-Webster Dictionary. Retrieved August 22, 2018. ^ "Nunez-Roches helps others". Hattiesburg American. November 26, 2014.